A much-expanded Special Issue devoted to the Glass House, the remarkable enterprise by Mary Lowndes and Alfred Drury just over a hundred years ago that led to a golden age of opportunity in British stained glass. Wilhelmina Geddes, Hugh Arnold, Moira Forsyth, Alan Younger, Theodora Salusbury, Christopher Whall, Margaret Chilton, Henry Holiday, John Hayward, Martin Travers, Mabel Esplin, Herbert Hendrie, Joan Fulleylove, Joseph Eddie Nuttgens, Keith New, Baron Arild Rosenkrantz, Caroline Townshend, Joan Howson, Robert Anning Bell, Margaret E. Aldrich Rope and Margaret Agnes Rope: just some of the artists who had studios in the Glass House or had their work made there. It is no accident that so many of these names belong to women stained glass artists, and in this year of the centenary of Women’s Suffrage, it is good to reflect that Mary Lowndes’ initiative also led to the emancipation of women in the work place, one we’re all very fond of at the BSMGP: the stained glass studio. These artists' windows throughout the UK and as far afield as Khartoum and Adelaide are testament to the importance of the Glass House in stained glass history. BSMGP member and author Alan Brooks carefully transcribed the business records of the Lowndes & Drury Archive, now held in the Archive of Art and Design in the Victoria and Albert Museum. Working with our Hon. Fellow Peter Cormack MBE, the issue now includes 3500 records and their evaluation, along with biographies of each of the 160 artists involved. 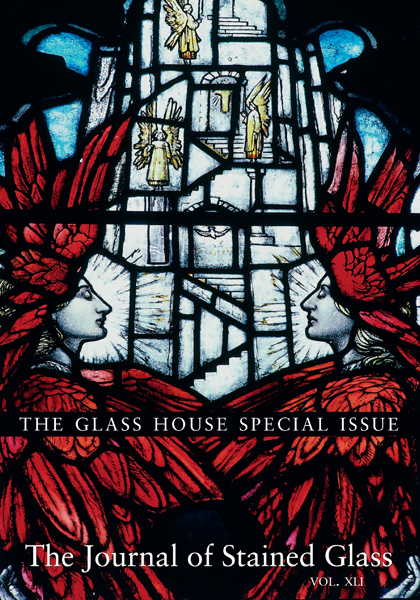 Cormack’s guest editorial explores ‘The Glass House: a Great Feminist Enterprise’.